Hey Guys! Hope you are doing well. I am back to give you valuable information as per your technical needs and requirements. Today, I’ll unlock the detailed Introduction to PIC16F877. It is an 8-bit PIC microcontroller that comes with 40-pin interface (PDIP). It is based on Flash type memory. The High-Performance RISC CPU is incorporated inside the device that comes with only 35 single-word instructions, targeting mainly two types of instructions: single cycle and double-cycle. In this post, I’ll cover each and everything related to PIC16F877: its features, pinout and pin description, main functions, memory interface, compiler and burner used and applications. Let’s dive right in and get down to the nitty-gritty of this tiny device. PIC16F877 is an 8-bit PIC microcontroller that is introduced by Microchip and is mainly used in automation and embedded systems. It comes in three packages known as PDIP, PLCC, and QFN where the first one is 40-pin while other two come with a 44-pin interface. It features 256 bytes of EEPROM data memory, 368 bytes of RAM, and program memory of 14K. This microcontroller version incorporates CPU, timers, 10-Bit ADC and other peripherals that are mainly used to develop a connection with external devices. The decent memory endurance around 1,000,000 for EEPROM and 100,000 for program memory, makes this device an ideal choice for many real-time applications. The Universal Synchronous Asynchronous Receiver Transmitter (USART) is very helpful for developing serial communication with other devices. Some internal and external reset features are added in the device that prevents the device from going stale, giving you a full authority to modify the controller as per your needs and requirements. If automation is anything to go by, you cannot write off the importance of this little toy. You have got a brief overview of the device. In this section, I have arranged the main features in a single table, making it easy for you to grab the main idea about the device. Let’s have a look at the table. These features will help you understand the main characteristics of the controller and guide you in making a final decision before you intend to incorporate this chip into a certain project. In this section, we cover the pinout of the controller and a detailed description of each pin. Following figure shows the pinout of PIC16F877. 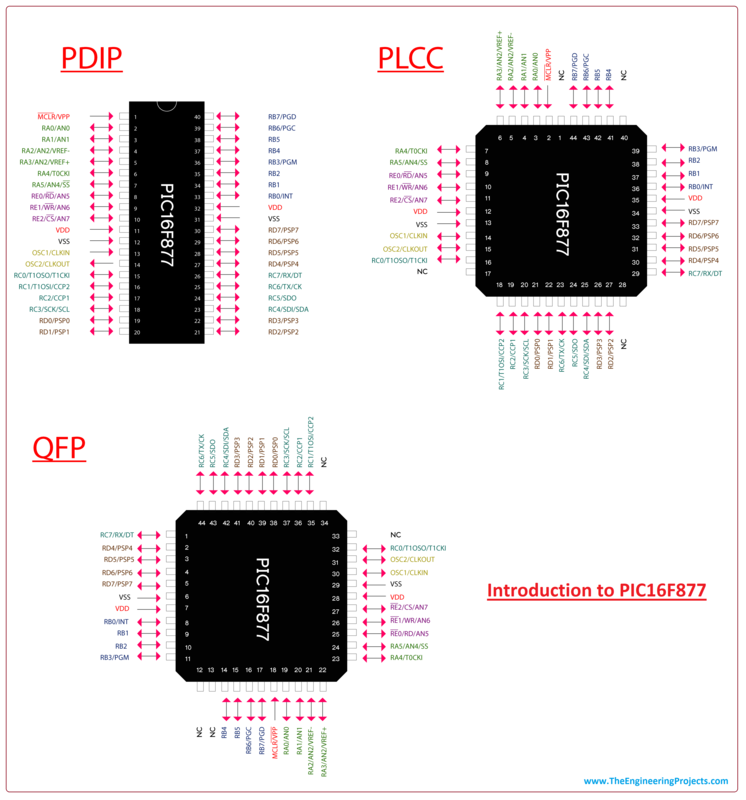 This module comes in three packages known as PDIP, PLCC, and QFP. The first one is mainly used for developing individual projects while other two are widely used in industrial applications. Following table shows the pin description of each pin. Some pins are capable to perform more than one function. This PIC model is capable to perform many functions similar to other controllers in the PIC family. Following are the main functions of PIC16F877. PIC16F877 comes with three timers known as Timer0 (8-bit), Timer1(16-bit) and Timer2 (8-bit). These timers can be used as a timer as well as a counter. The timer mode is mainly used to increment the instruction cycle while the counter mode plays a vital role to increment the rising and falling edge of the pin. All three timers contain internal and external clock select capability. PIC16F877 incorporates a USART (Universal Synchronous and Asynchronous Receiver and Transmitter) module that is mainly used to establish the serial communication with external devices. This module involves two pins known as TX and RX where former is used for transmitting serial data while later is used for receiving the serial data across the attached devices. PIC16F877 comes with a built-in watchdog timer that takes the controller back to reset position if the program hangs up during compilation or gets stuck in the infinite loop. It is nothing but a hardware timer that produces a system reset if the main program fails to periodically service it. It is advised to reset this timer to the initial value after every 3 instructions in order to avoid it going to zero value in normal conditions. The Watchdog Timer can be controlled only through configuration bits. It comes with its own RC oscillator for maximum reliability. The BOR function is a very remarkable addition that puts the device in reset condition once the Vdd (voltage supply) drops below a brownout threshold voltage. If the Power Up Timer is kept enabled, it will create the delay for returning the device from a BOR function. The BOR mode can be configured both ways: BOREN settings in a register or using programming. The multiple voltage ranges are provided to secure the chip if the power drops at the voltage supply line. In-circuit serial programming (ICSP), also called In-system programming (ISP), is a function that allows the chip to be programmed in the required project after installation, setting you free from plugging and unplugging the device in the project over and over again. The MCLR pin serves as an external reset for the chip. This pin is independent of the internal resets and is activated by keeping this pin at a LOW value. The MCLRE configuration bit is mainly used to disable MCLR input and the noise filter is included in the MCLR executing process that allows to detect and remove the small pulses. Power On Reset function is a very useful function that resets the controller and prevents it from malfunctioning. When the module is powered on, the power-on reset will start the module from scratch once the Vdd raises above a certain threshold value. (POR), a Watchdog Reset(WDT) and external MCLR Reset. Serial Peripheral Interface (SPI) is a remarkable function of the chip that is commonly used to send data between microcontrollers and small peripherals such as sensors, shift registers, and SD cards. It comes with separate clock and data lines, layered with a select line to choose the device for communication. The I2C is a two-wire interface communication that comes with two main lines known as SDA and SCL where former is s serial data line that carries the data and later is serial clock line that is used to synchronize all data transfers over the I2C bus. PIC compilers and burners are used for different purpose. The former is a software used to write the desired code for the module while later is used to transfer and burn the code on the module. There are various compilers used for the PIC controller and MPLAB C18 Compiler is an official compiler main developed for the PIC modules. You can get this compiler online from the Official Microchip Site. MikroC Pro For PIC is a third party software and is a good replacement for PIC standard compiler. These Top 3 PIC C Compilers give you the flexibility to choose from and pick any compiler as per your needs and demands. The code written in the compiler generates a hex file which is then transferred to the microcontroller using a burner. The PICKit3 is a standard PIC burner for PIC controllers. Other burners are also available in the market but PICKit3 is mostly preferred for the PIC controllers. Let’s get down to the main features of each memory. The Program memory, also known as ROM memory or Flash memory, stores the number of instructions permanently. It comes with a memory space around 14K and is independent of the power supply i.e. have the ability to store information in the absence of main power supply. The EEPROM Data Memory is similar to ROM memory with one exception i.e. the instructions in EEPROM can be controlled and modified during the controller operation. The EEPROM incorporates memory space around 256 bytes and is mainly addressed by multiple control registers. These registers are spread across the multiple banks and are the data holding places that can hold instruction, storage address, and any kind of data ranging from an individual character to bit sequence. General purpose registers are implemented as a static RAM and can be easily accessed by File Select Register. They store any modified or random value in the processor and are located on the upper side of banks. On the other hand, Special function registers are located on the lower side of the banks and are used to control the peripheral functions, covering the first 32 locations of each bank. 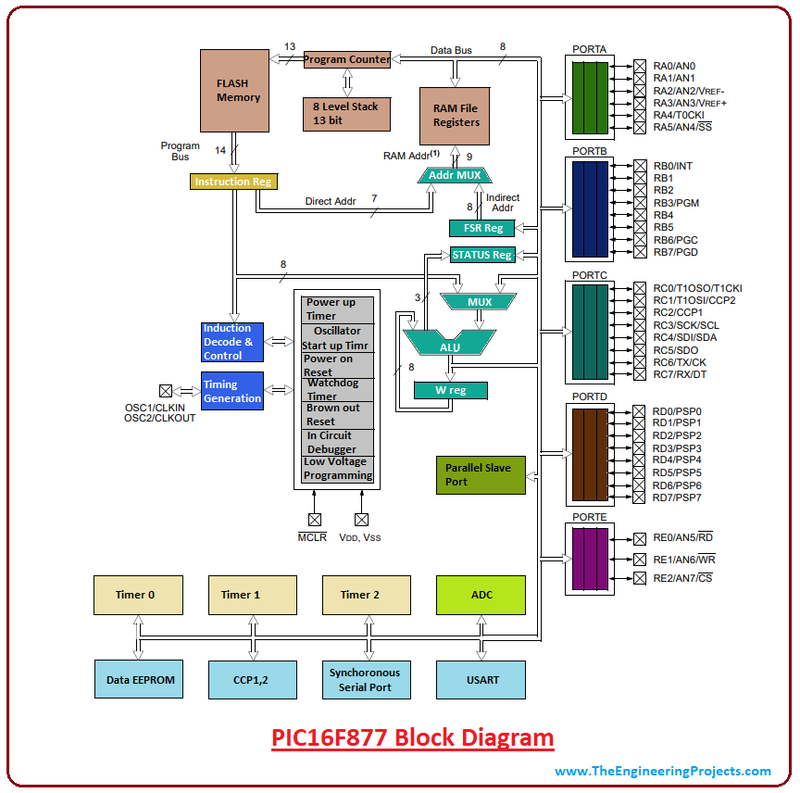 The following figure shows the block diagram of PIC16F877. PIC16F877 comes with five ports where each port contains 8 pins except the E port that comes with 3 pins. PIC16F877 comes with a variety of applications with the main aim to drive automation in the relevant project. Following are some major applications it can be used for. Earlier, if you were aiming to design the automation project, you’d need a bunch of wires and a plethora of electrical components, that would not only cost you more but making your project heavy with more space requirement. These PIC controllers prove to be a lifesaver for your technical needs requiring minimum circuitry. These controllers come with a user-friendly interface and easy onboard architecture that requires little or no prior skills before getting familiar with the chip. PIC controllers have a leg over other Atmel controller like 8051 due to their higher processing speed and efficiency. They are very handy in terms of consuming minimum power consumption that makes this controller an ideal choice for the projects where power limitation is a major concern. That’s all for now. I hope I have given you everything you needed to know about PIC16F877. If you are unsure about anything you consider I have left unsaid about this chip, you can ask me in the comment section below. I’d love to assist you in any way I can. You are most welcome to keep us updated with your valuable suggestions, we plan our content strategy based on them, so keep them coming. Thanks for reading the article.